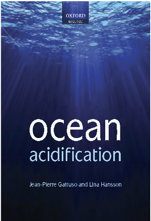 Increasing concentrations of atmospheric carbon dioxide are causing oceanic pH to decline worldwide, a phenomenon termed ocean acidification. Mounting experimental evidence indicates that near-future levels of CO2 will affect calcareous invertebrates such as corals, molluscs and gastropods, by reducing their scope for calcification. Despite extensive research into ocean acidification in recent years, the effects on non-calcifying anthozoans, such as sea anemones, remain little explored. In Western Europe, intertidal anemones such as Actinia equina are abundant, lower trophic-level organisms that function as important ecosystem engineers. Changes to behaviours of these simple predators could have implications for intertidal assemblages. This investigation identified the effects of reduced seawater pH on feeding and contest behaviour by A. equina. Video footage was recorded for A. equina feeding at current-day seawater (pH 8.1), and the least (pH 7.9) and most (pH 7.6) severe end-of-century predictions. Footage was also taken of contests over ownership of space between anemones exposed to reduced pH and those that were not. No statistically significant differences were identified in feeding duration or various aspects of contest behaviour including initiating, winning, inflating acrorhagi, inflicting acrorhagial peels and contest duration. Multivariate analyses showed no effect of pH on a combination of these variables. This provides contrast with other studies where anemones with symbiotic algae thrive in areas of natural increased acidity. Thus, novel experiments using intraspecific contests and resource-holding potential may prove an effective approach to understand sub-lethal consequences of ocean acidification for A. equina, other sea anemones and more broadly for marine ecosystems. Bamber T. O., Jackson A. C. & Mansfield R. P., in press. The effects of ocean acidification on feeding and contest behaviour by the beadlet anemone Actinia equine. 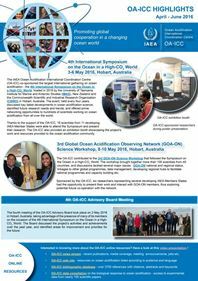 Ocean Science Journal. Article (subscription required).